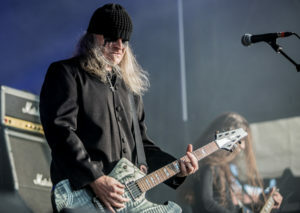 Celtic Frost’s former frontman, guitarist and singer Tom Gabriel Fischer, adopted the alias Tom Warrior. With Steve Warrior on bass, he formed one of the earliest extreme metal bands, Hellhammer, in 1981. Steve Warrior was later replaced by Martin Eric Ain – also a pseudonym. The band attracted a small international fan-base, got signed to Noise Records in Germany and recorded their debut EP Apocalyptic Raids in March 1984, now a rare finding on eBay or second hand record stores around the world. By May 1984, Hellhammer had disbanded. Fischer and Ain, along with session drummer Stephen Priestly, regrouped as Celtic Frost. Their 1984 debut mini-LP, Morbid Tales was a hit in the underground metal scene, and the band set out on its first tour, through Germany and Austria. This was followed with an EP Emperor’s Return. Both early releases are now available on the one CD. One of their more influential recordings was 1985’s To Mega Therion which did not feature Ain on bass, but stand-in Dominic Steiner. The cover artwork is a painting by H.R. Giger entitled Satan I. The album was a major influence on the then-developing death metal and black metal genres. Ain did return after the album was recorded however. In 1987 followed Into the Pandemonium. 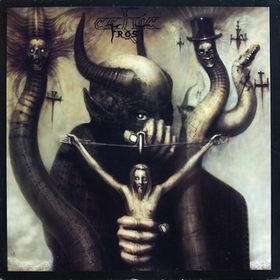 The album is more varied than many of Celtic Frost’s past LPs, with unlikely covers (Wall of Voodoo’s “Mexican Radio”), emotionally charged love songs, the album’s recurring industrial-influenced rhythmic songs of demons and destruction, traditional Frost styled songs about dreams and fear, and a dark, classical piece with female vocals. The album is vastly different from the band’s previous work and cemented its late 80s avant-garde metal term; it is also a departure from the extreme style found on the band’s previous albums, Morbid Tales and To Mega Therion that Celtic Frost had become known for. However, it does have the recurring symphonic elements found on previous albums. The album has a more classic heavy metal style within the songs with elements of industrial, classical and gothic rock, and even has a hip hop/dance inspired rhythm in “One in Their Pride”. It does have a few black metal elements remaining in Tom Warrior’s vocals, though, and some thrash-influenced guitar riffs. 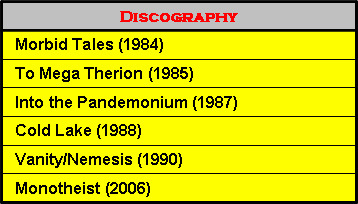 These albums were some of the pivotal LPs for underground metal and inducted a new and more varied sound. 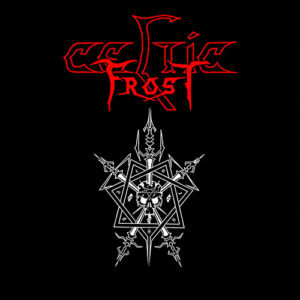 Celtic Frost, along with Venom and Bathory were pioneers in the still underground black metal scene, although Celtic Frost were much more experimental with the addition of classical instruments, operatic female vocals and sampling. Celtic Frost was often labeled by critics as avant-garde metal. After a subsequent North American tour (which saw the addition of a second guitarist, Ron Marks to the group’s ranks), financial trouble, personal tension between the band members and an ill-fated relationship with their record label led to a complete dissolution of the band. Six months later, Warrior decided to reform the band with Stephen Priestly back on drums, Oliver Amberg on guitars and Curt Victor Bryant on bass. The resulting album Cold Lake was a disappointment to most of the group’s established fan-base but achieved notable success in the North American market. Bryant fired Amberg and former live guitarist Ron Marks returned for the recording of Vanity/Nemesis in 1990. The most significant change, however, was the return of early bassist Martin Eric Ain but Celtic Frost’s reputation did not fully recover. The group’s next (and, as it would turn out, last for several years) album was a collection of rare recordings called Parched With Thirst Am I and Dying (1992). The compilation’s title was inspired by an old Roman prayer. It featured unreleased material, re-recorded versions of older songs and some studio session versions. A final album titled “Under Apollyon’s Sun” was never made under that title, although Fischer co-founded a new group called Apollyon Sun. Several years following the disbanding of Celtic Frost, and after quite some time spent away from the music industry, Fischer co-founded a new group called Apollyon Sun with his close friend Erol Unala on guitars in the mid-1990s and recorded an EP God Leaves (And Dies) and a full-length album Sub. Although clearly based on Celtic Frost’s dark and more adventurous music, Apollyon Sun was an industrial metal project. During his hiatus from music, Fischer had also finished work on an autobiographical book, called Are You Morbid?, which was published by London-based Sanctuary Publishing to fan acclaim in 2000. In late 2001, Fischer and Ain began to write music together again, along with Unala on guitar and, from late 2002, experienced Swiss drummer Franco Sesa (also known within the group as the Inverted Cross). The aim was to develop and record a new, very dark and heavy album. The completion of the project took far longer than anticipated, the album, titled Monotheist, was released on May 30, 2006. 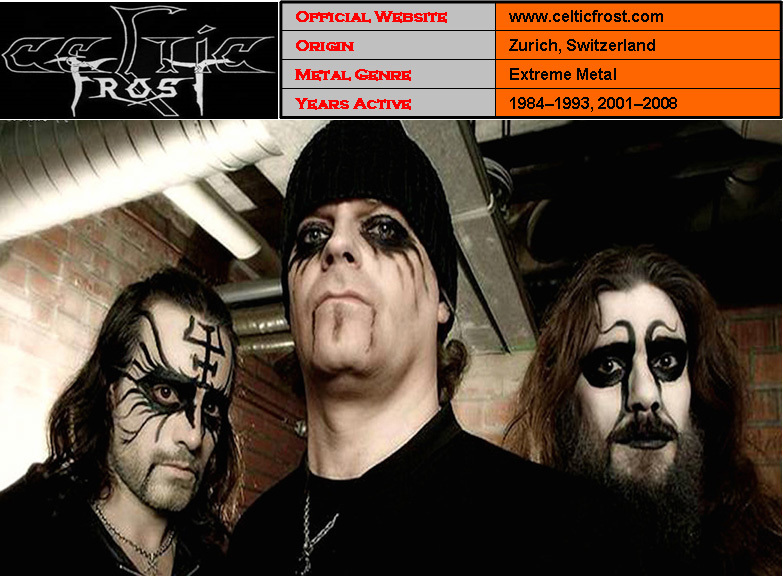 In early 2007, Celtic Frost began writing material for a new album, possibly due for release in 2008. As of Celtic Frost’s announcement of their second breakup in September 2008, there is no talk of recording and releasing the new album. On September 9, 2008, Celtic Frost members Martin Eric Ain and Tom Gabriel Fischer confirmed on Celtic Frost’s official website that the band had “jointly decided to lay Celtic Frost to rest for good”. The last shows of Celtic Frost were in Mexico, one on October 12, 2007 in Monterrey, and the last one on October 13, 2007 in Mexico City. As Celtic Frost changed their sound throughout their career, their exact genre has been a topic of debate. Their earlier music was sometimes classified as thrash metal, black metal, and even death metal and their later work as doom metal and gothic metal. With the album Cold Lake they were said to experiment with glam metal. The level of experimentation on albums such as Into the Pandemonium led certain journalists to describe the band’s direction as avant-garde metal.